Photo: Ken Schwartz In addition to writing and filmmaking, Russ Spencer (second from left) had a passion for music. 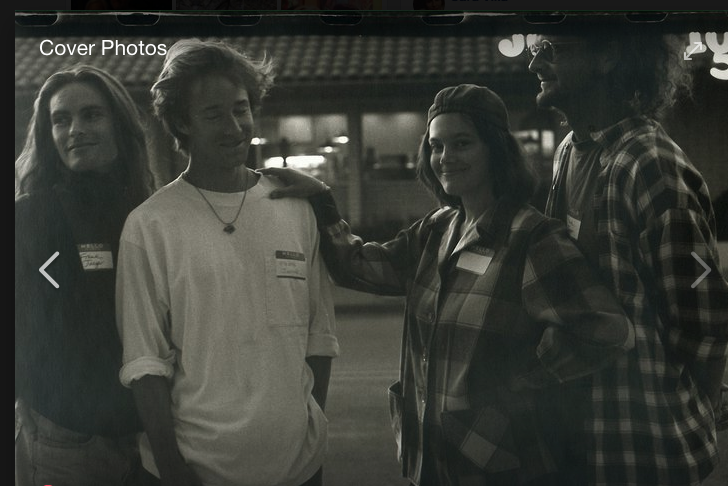 He sang and played guitar in a band called Frank Jaegers, which also included (from left) Grant Friedrich, Ellen Turner, and Pete Lester. I never knew Russ Spencer, but in a way, he helped give me a purpose. One of the original columnists for the Positively State Street column, he benefited generations of musicians, artists, and writers alike as a spokesperson of Santa Barbara’s music scene. Russ passed away in the early hours of Saturday, March 23, on the 101 freeway; it was likely a suicide. The world stopped for a moment the day he passed. I remember: Traffic came to a standstill. Someone had been on the road, I’d heard, but details were then publicly unknown. I was stuck in traffic on the 126 near Fillmore that Saturday morning due to another, different car collision that ended someone’s life mere hours and miles apart. The two major highways were gridlocked in the halting presence of death. Depression is a monster far too many know well. Locally, resources such as Santa Barbara’s Mental Wellness Center (mentalwellnesscenter.org) or the National Alliance on Mental Illness (nami.org) are vital, life-saving resources for the very common phenomena of mental illness and brain disorders. Organizations like these are incredibly important for transferring the isolation of depression, schizophrenia, bipolar, anxiety, and other conditions into the supportive hands of a knowledgeable and compassionate community network. Perhaps one of Russ’s further gifts is showing that even the brightest, most positive people carry in them the darkest of depths, and for that, he gifts us a sense of understanding. For some, tragically, family and friends can do everything right, and yet the inner demons may still get the upper hand. But in this case, I don’t think they exactly won. Russ’s legacy continues to live on not just in the column he co-created, but in all the lives he touched, the people he inspired, the careers he furthered, the good times he sparked. I never knew Russ, but I have felt directly his gifts as a person and feel very grateful. Thank you, Russ, and rest in positive peace.